"My picky teens who hate zucchini love this hearty main dish. And I love it because it gives me one more way to use up the overabundance of zucchini from my garden." Scoop flesh out of zucchini using a spoon, creating boats. Mix turkey, green bell pepper, onion, egg, bread crumbs, jalapeno pepper, cilantro, garlic, steak seasoning, cumin, and thyme together in a large bowl. Fill zucchini boats with turkey mixture. 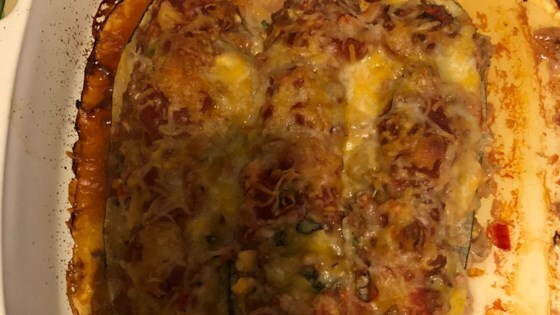 Cover with salsa and Cheddar cheese. Bake in the preheated oven until turkey is no longer pink in the center and zucchini is very tender, about 45 minutes.